Pan Seared Scallops – simple and beautifully seared scallops served with a flavorful brown butter and lemon pan sauce. 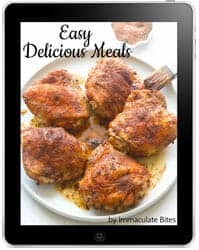 So easy, delectable and juicy! 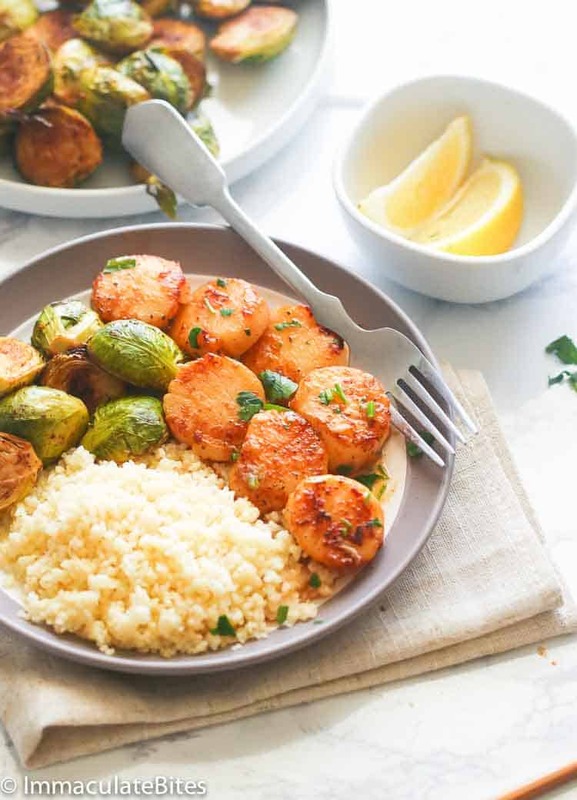 Aside from shrimp and fish, scallops is also one of our favorite seafood to eat. But it’s kind of tricky to cook, though. For all we know, cooking scallops could also end you up washing your money down the drain. 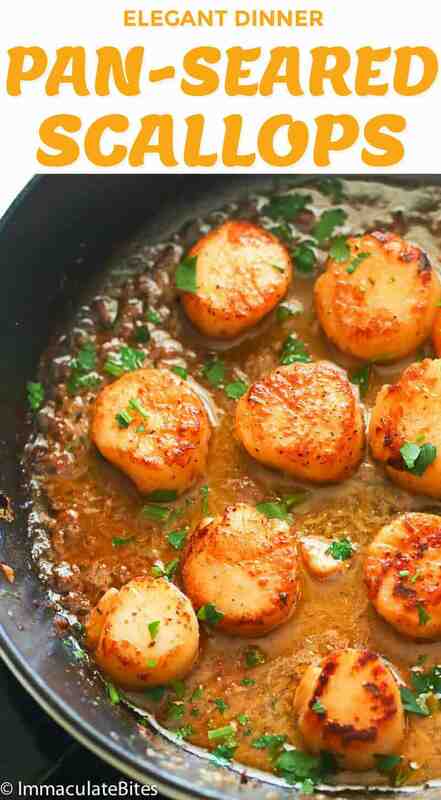 If you overcook it even just for few minutes, you’ll end up rubbery or chalkboard scallops. Yikes! But once you get the hang of cooking it, you’ll be wanting it on a weekly rotation, especially that there are already prepped scallops packed at any grocery stores. Of course, nothing beats those large day boat scallops which are harvested on a boat that returned to the shore the same day the scallops were caught. 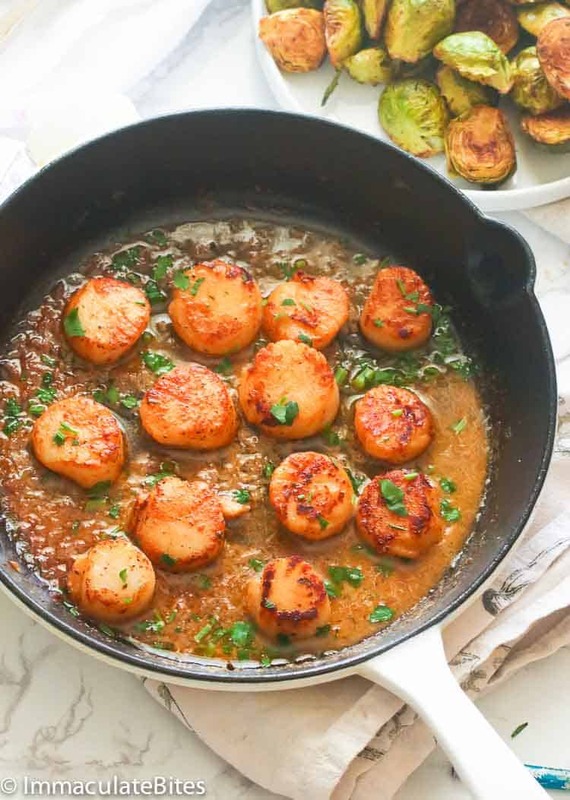 Perfect pan-seared scallops takes only minutes to cook, however, you need to learn the very basics on how to cook scallops so you’ll achieve that perfect golden brown crust. First off, you need to make sure that your scallops are completely dry. Any excess liquid will interfere the searing process. Instead of a tender, brown-crusted scallop, you’ll have tough and pale ones. What I do to take off any excess liquid is to line a a large plate with paper towels, place the scallops on it and top it with more towels and let it sit while you prepare the rest of the ingredients. Once they’re dry, you can start seasoning them. Second, check the heat of your pan. Cooking scallops requires a smoking hot pan. Moreover, do not overcrowd the pan with scallops as this will drop the heat level of the pan. Always, work in batches. And this one is important: DO NOT be tempted to turn over the scallops immediately. Moving them around prevents the forming of that nice brown crust. Let the hot pan do its job, friends! And lastly, serve it right away. Scallops are best enjoyed straight off from the pan. It gets rubbery if you wait too long to serve it. 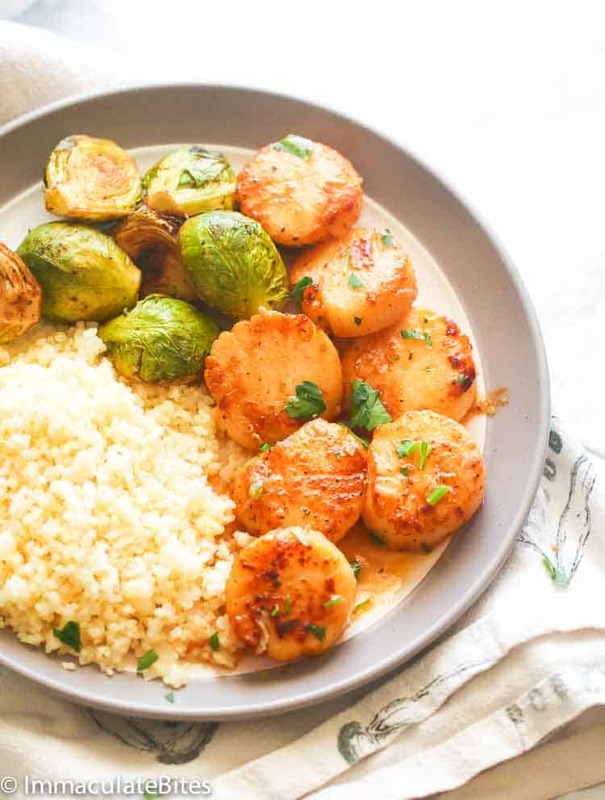 Pan-seared scallops are best served along with roasted brussel sprouts or with your preferred roasted or steamed veggies. Enjoy! Use a non-stick pan or cast iron, for this recipe. If you’re using frozen scallops, make sure to thaw them overnight in the fridge on a rack (with space between them) with a pan underneath to catch all the drip. You may omit the creole seasoning if it’s too spicy for your taste. Do not overcrowd the pan. Cook them by batches. Let the scallop brown first before moving them around. Rinse the scallops with cold water. Pat dry with paper towels. Line a large plate with paper towels, then place scallops on paper towels. Top with more towels and thoroughly pat dry to absorb any liquid to ensure a good sear. Let it sit while you prepare the rest of the ingredients. Salt and pepper (you may omit if creole seasoning is too spicy) scallops, then season with salt free creole/cajun seasoning. Add oil to cast iron or skillet, then heat on medium to high heat until it starts to reach the smoking point. 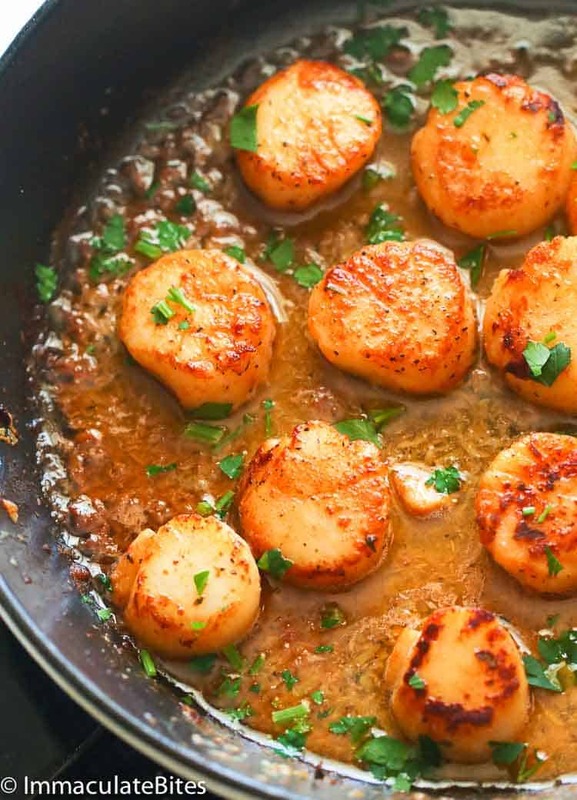 Once cast iron is hot, add scallops, leaving space between them, sear on each side , about 2-3 minutes, until firm almost firm to touch and golden brown. In order to get a good sear, do not turn scallops around. 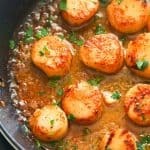 Remove pan from the, heat, transfer the scallops to a plate, and set them in a warm spot. Let the pan cool for a minute before proceeding with the sauce. Add butter to the skillet , followed by, garlic, saute for about one minute or less, add white wine, stir and scrape up any brown bits from the side of the pan. simmer until reduced by about half, another 1 to 2 minute. Add lemon zest, lemon juice, remaining butter, salt and pepper flakes, if desired, adjust seasonings . Return scallops back to the pan,along with any liquid from the scallops. Sir to coat , add parsley. Remove immediately from the heat and serve with the pan. Rinse the scallops with cold water. Pat dry with paper towels. Line a large plate with paper towels, then place scallops on paper towels. Top with more towels and thoroughly pat dry to absorb any liquid to ensure a good sear. Let it sit while you prepare the rest of the ingredients. Salt and pepper (you may omit pepper if creole seasoning is too spicy) scallops , then season with salt free creole/cajun seasoning. Add oil to cast iron or skillet, then heat on medium to high heat until it just starts to reach the smoking point. Once cast iron is hot, add scallops, leaving space between them, sear on each side , about 2-3 minutes, until firm almost firm to touch and golden brown. In order to get a good sear, do not turn scallops around. Remove pan from the, heat, transfer the scallops to a plate, and set them in a warm spot. Let the pan cool for a minute before proceeding with the sauce. Add butter to the skillet , followed by, garlic, saute for about one minute or less, add white wine, stir and scrape up any brown bits from the side of the pan. simmer until reduced by about half, another 1 to 2 minute. Add lemon zest, lemon juice, remaining butter, salt and pepper flakes, if desired, adjust seasonings. Return scallops back to the pan,along with any liquid from the scallops. Sir to coat , add parsley. Remove immediately from the heat and serve with the pan. Going to make this for one of the protein dishes for Christmas, I was sold at Creole seasoning, thank you! Creole Seasoning takes it up a notch. Happy Holidays !!!! To be honest any white wine would work, if you can drink it, you can use it . I used Sauvignon Blanc, chardonnay would work as well.